If you are planning a renovation project at your property, it may be that you have considered removing a fireplace and chimney breast from a room to give some valuable extra space. 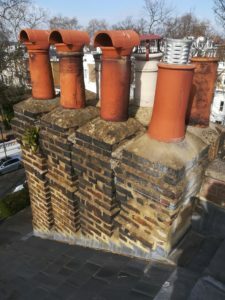 It is worth getting expert advice on how to do this to avoid compromising any remaining flues and ensuring that the remaining chimney is properly supported. This kind of work must meet the standards required by Building Regulations and is ‘notifiable’. That is, you must inform the local authority Building Control department and make an application or use an independent approved inspector who will do this on your behalf. The fee for this service is £200 – £220 + VAT. Have a good look at your chimney stack. If you are in a terraced, semi-detached or a large property it may be that your chimney stack is shared by more than one flue. Each fireplace and chimney breast will have its own flue and chimney pot. The correct flue and chimney pot will need to be identified before any work can start. A double banked chimney stack is easier to work with than a single banked one. Removing a flue from a single banked chimney stack is almost impossible to do without damaging other flues within the stack. This is particularly important to consider if you regularly use the other flues or if the adjacent flues belong to your neighbour. Any smoke leaking from a used flue into a property could cause harmful carbon monoxide poisoning. Additionally, any gas, plumbing or electrical services for current or old heating appliances need to be isolated and removed before any work can start. Removing a chimney breast will create a large amount of dust and debris, so the room should also be cleared. If any part of the work that you are planning to carry out takes place on or close to the boundary with a neighbouring property, including shared party walls or structures, you must notify your neighbour of your intentions under the Party Wall Act. This is because any changes that you make will affect your neighbour. 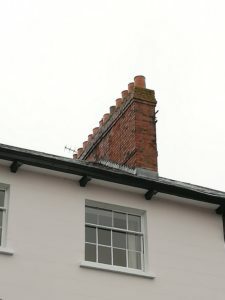 Chimney breasts are generally built into a wall that forms part of a property’s load bearing structure. Therefore, when removing a fireplace and chimney breast consideration must be given to providing enough safe support for the top of the structure once the bottom of the structure has been removed. A Structural Engineer will be able to identify which type of support is most suitable for your property. If you intend to keep the outside part of the chimney which appears above the roof line because of planning permission requirements or to maintain the look of the property, this will also need to be supported. There are several different ways to achieve proper structural support. A structural steel beam called a Rolled Steel Joist (RSJ) can be inserted to provide a solid support for load-bearing walls. Alternatively, gallows brackets can be used. Gallows brackets are a right-angled support that resemble a hanging gallows, hence the name. These are attached to the wall and work best when fixed to a thick brick wall that is in good condition (the wall must have a minimum thickness of 225mm). There are limits to the situations where gallows brackets can be successfully used. Most Structural Engineers will prefer to use a supporting steel joist. Additionally, many local authorities will no longer accept the use of gallows brackets and will insist on the use of a steel joist. What do I do with the gap that is left by the chimney breast and fireplace? There will be a recess left after the chimney breast has been taken out. This space will need to be filled in with brickwork to make sure the wall is the same thickness and density as the other walls, and all of the joints will need to be packed with mortar. Filling the void left by removing the fireplace and chimney breast will also help with sound insulation. When the ground floor stack is taken down to floor level you must ensure that damp prevention systems are in place that are suitable for the concrete or timber under floor structure. If you are only removing the fireplace and chimney breast from one floor, adequate ventilation must still be provided within the chimney structure on any floors higher up to prevent damp. Removing a chimney breast and fireplace is a significant job. It is always best to take advice from professionals before starting. If you would like more information please call Turner Baker on 01432 839123 or complete our contact us page.